Sanuk: They’re Not Shoes…They’re Sandals(Giveaway)! I’ve always claimed that you can tell alot about a person by looking at their shoes! I know, it sounds silly but it’s very, very true. I’m happy and silly and creative and most of the time (even in the dead of winter) you’ll find me in flip-flops. It drives my husband nuts, primarily because he feels awful that I’m standing in the rain in flips and I’m far too stubborn to put shoes on. 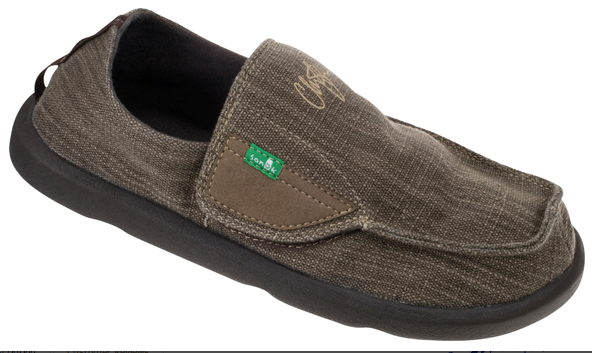 Here enters Sanuk and their “not shoes” philosophy…. You heard me..Sanuk. Sanuk is the Thai word for fun and it’s also the companies mantra! Started in 1997, Jeff Kelly started making sandals out of inner tubes and carpet and their popularity has catapulted them to into a highly sought after footwear company. Sanuk’s goal is to create footwear that’s creatively inspired, yet thoughtfully designed. A well thought out plan, in my humble opinion, and one that has clearly stood out among it’s peers! We’ve been fans of Sanuk for some time now, in fact both my husband and I own multiple pairs. Sanuk’s really aren’t shoes, their much more like sandals and they are one shoe that I don’t mind wearing in both the summer and winter. I’m not sure exactly what their putting in their shoes, but they are the most comfortable shoes I have ever worn and they really feel like you don’t have shoes on..cause you know their sandals, right? Sanuk sent my husband these kickin’ shoes sandals and he did a happy dance when they arrived. No, really, he did! I was also surprised when I opened the box to reveal these kickin’ shoes sandals for me…. Sanuk also makes kids shoes and can you imagine what happened when Big Pea found out about that? You know you want some!!!!! Sanuk shoes sandals retail for $14-$110 and are available in men’s, women’s and children’s sizes! You can purchase Sanuk’s online or find a retailer near you! 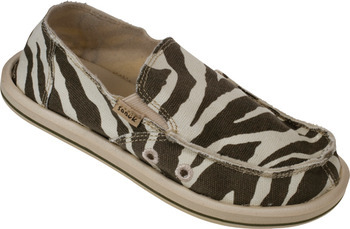 One lucky “Deal”ectible Mommies reader will WIN a pair of Sanuk Shoes Sandals (winners choice)! How to Enter: Simply visit Sanuk and tell me which pair is your favorite and your entered to win! The boring stuff: US residents only. Giveaway ends on October 30th at midnight! Winner will be chosen at random. Disclaimer: I was provided with Sanuk’s to facilitate my review. My thoughts and opinions remain my own Mr. FTC! Follow Us on Pinterest to Win an Amazon Gift Card! I LOVE the Star Dust Sanuk! SO cute! My favorite pair is the Donna Hemp! I ADORE the “I’m Game” shoes…must get some! I commented on your Total Gym Total Mom Challenge: Week 3 post. I like the “I’m Game” and the “Del Mar.” They have some cute styles! I love the YOGA SAFARI flip-flops! Shannon´s last blog post ..100 Days Left to Make 2010 Your Year! I’m a Fan “Deal”ectible Mommies on Facebook! mommy-momo´s last blog post ..W-W Best buds at Disneyland! The Juno is my favorite! I like the men’s boardroom. I am your email subscriber! My favorite are the Yoga Mat sandals! They look so comfy! My favorite is the Scribble Sidewalk Surfers! The Laurel is my favorite! My favorite pair is June Bug in either black or grey. I love Sanuk! I follow “Deal”ectible Mommies on Twitter as Chelyea and tweeted. I’m a fan of Sanuk on facebook. I follow Sanuk on twitter as Chelyea. I liked the June Bug. Loving the kids CULPRIT! Thanks for the chance. The Rasta Sprouts are my favorite. I follow on twitter and tweeted as humanecats. I follow Sanuk on twitter as humanecats. Love the MARDI GRAS shoes!! I would love to get the Rascal for my son. I like the Rosalyn sandals! I like the Kitty Hawk and the Star Dust best. I like the Scurvy Women pair in purple. Thanks. I love the Pay Raise Women’s Sandals! My hubby owns 3 pairs and loves these shoes! I would love to have my very own! My favorites are the zebra I’m game ones! Thanks for the chance! I’d like the Dreamcatcher boots, uhh… I mean sandals. I love the Espathrills and the Pony Ups! I couldn’t decide between the two! I tweeted about the giveaway (@booksaresexy). I subscribe to your e-mails (sounravelme@gmail.com). I am a fan of Sanuk on facebook. I follow Sanuk on Twitter. i like the I’m Game. I like the LIL KITTY CHILL shoes for my daughter. Thank you so much for the wonderful giveaway! I like the Donna Chill style. I can’t decide between Tweedy and Espathrill – both look so cute and comfy!! I’m liking both SCURVY WOMEN and PLAIN JANE. They both suit my style. My fiance surfs and loves this name brand. We’re on a tight budget saving for our wedding and our first home so winning these for him so I could give them to him as a christmas gift would be wonderful! The Cheyenne Sidewalk Surfers are my favorite. Id love to have the Overboard but I think is out of stock …Id take the Shoreleave for my husband or the Perfect Plaid in Grey for my teen son! I like the Espathrill Sidewalk Surfers. I follow Sanuk on twitter as well! I would love to have the Women’s Catalina Shoes. I am following Sanuk via Twitter as jlsc123. I am a fan of Sanuk via Facebook as Jill Myrick. I like the vagabonds for the hubby. size 13. I love the Kitty Hawk! i love the june bug in black! I love the Kiss and Tell sandals! I follow Sanuk on twitter, username slowclublover. My favorite is the Espathrill Sidewalk Surfers. My favorite is the Cheyanne Sidewalk Surfer. Subscribe to you via email. I love the SCRIBBLE sidewalk surfers. I LOVE, LOVE, LOVE the Pony Up and the Scribble Kids! Truly Fun and Unique designs~ I too have a wish list made out, lol. Thank you Sanuk and “Deal”ectible Mommies for a GREAT giveaway! I like Shore Leave. thanks. I really wanna try the Sadie shoes. I really love the Kitty Hawk pair. Shore Leave is my fav. Chrysa´s last blog post ..Lots and Lots of Halloween Freebies!!! I absolutely love the Woodstock sandals! I like the cute Yoga Spree sandals!